So, again, I claimed that the Fish Fryday for this past week was canceled due to other things coming up, but then they changed and changed and changed and the next thing I knew I was sending out a text message to go get some fish. 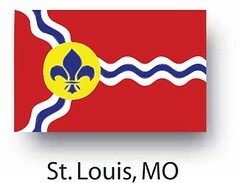 This week, I chose a recommendation that I was given for a church in Boulevard Heights St. Louis, Immaculate Heart of Mary. 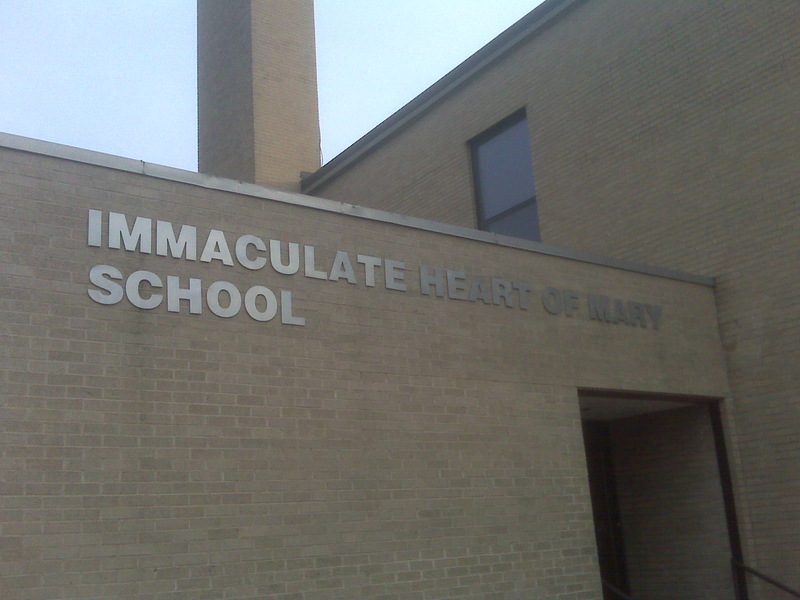 This place was nestled into a nice neighborhood on Blow St. and when we arrived, we were awed by the bigness of the complex they have at Immaculate Heart. But, I could smell fish frying somewhere, so we knew we were in the right place. As we followed an elder lady we then came across several children who: nearly knocked me down, yelled to their friends while standing right behind me, and played on the railings as though they were a jungle gym. However, what was strange was, as soon as we got inside, there were no children at all acting up. So, into the fish fry fray we go. 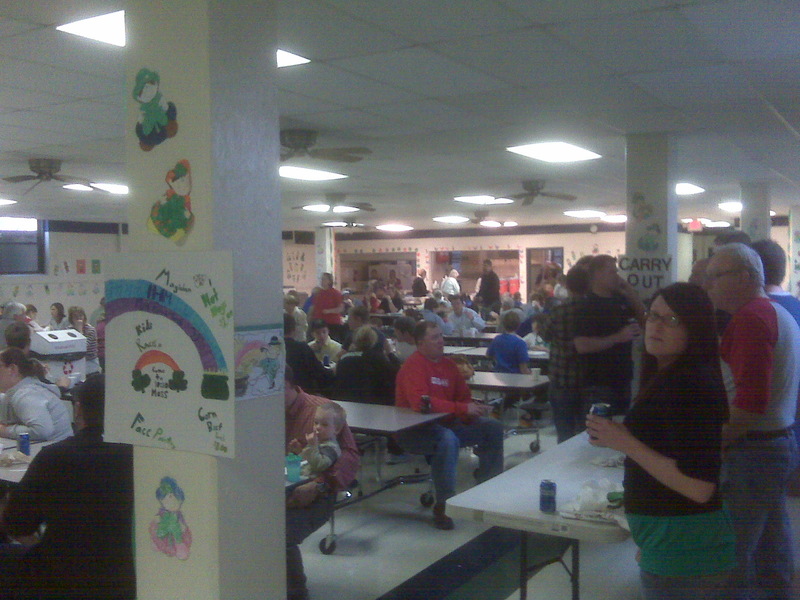 What I was noticing about this place as we walked around a bit, was that it was an Irish Fish Fry. The only problem is that I really don’t know what that means. 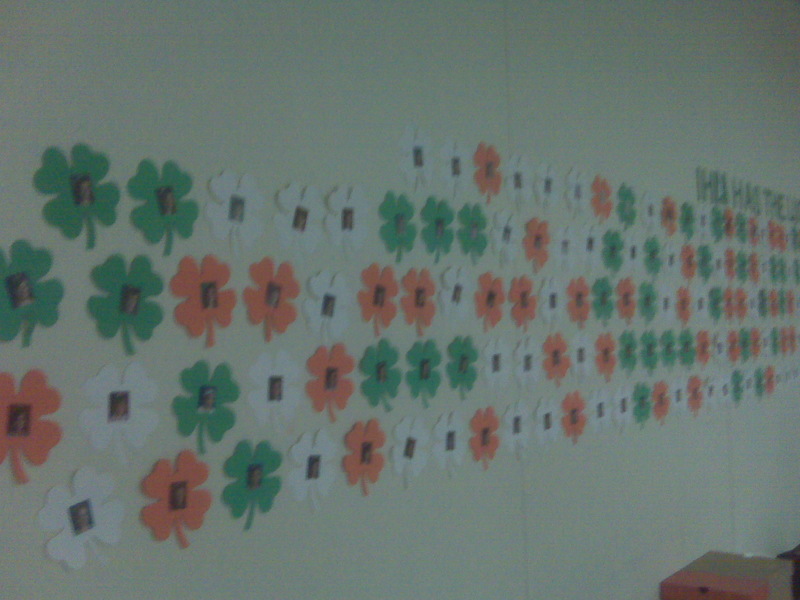 Even after attending, the only thing different I could find where the leprechauns and the Irish flags on things. I suppose that’s the only real difference and that they’re proud of their heritage, which is awesome, and something I understand, being quite proud of my Scottish heritage myself. So, here you pay ahead of ordering instead of after. We walked over, I saw a hot and spicy cod sandwich and was quite prepared to order this gem of a concoction, but decided against it. I stuck with my standard fried cod plate. 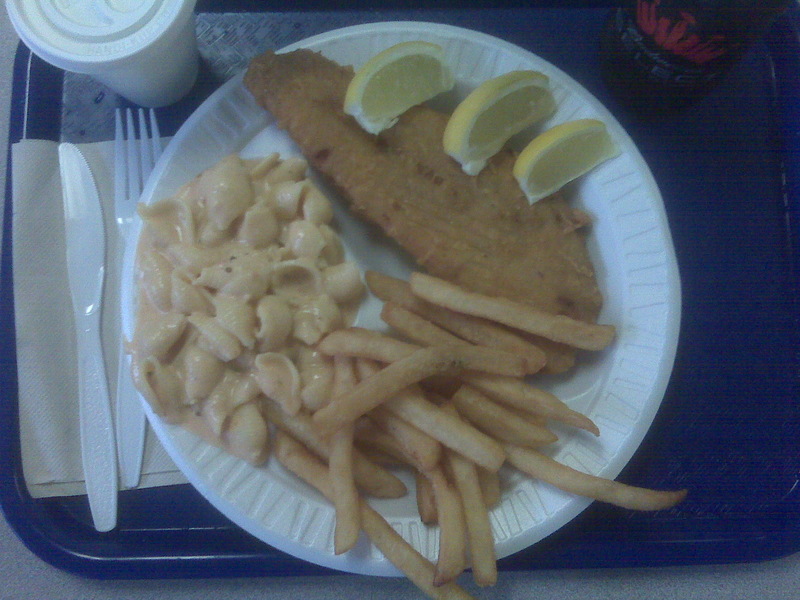 So, the plate for the cod and two sides were eight dollars. This isn’t a bad price, but not a great price either. It’s the same as what we paid at St. Stephens, but was it as good? Let’s find out! 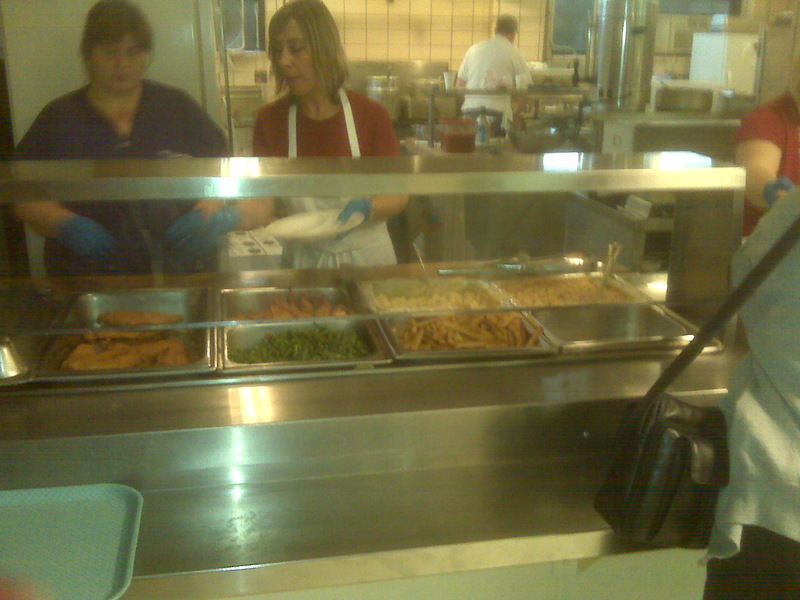 Here we have the nice ladies running the kitchen and handing out our food. Very quickly, they noticed that I was taking their picture. 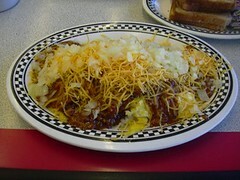 Over the last month or so, I’ve been caught photographing my food. Then they want to know why, and anyway…more on that later this week in the next slinger post. 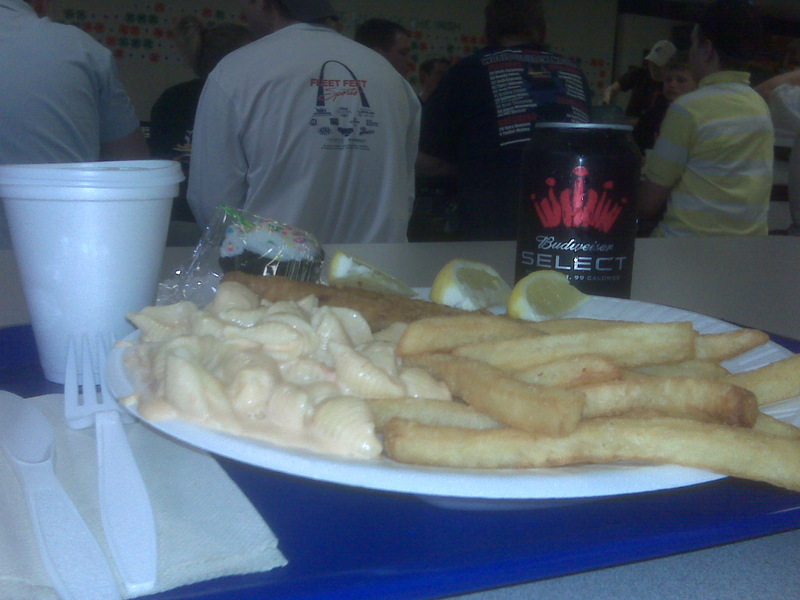 So the ladies jovially said, “He’s here to review the best fish fry in St. Louis!” I love the attitude! So, with my cod I also asked for fries and the red sauce pasta. I always want everything fried I can get to go with my fried fish. I mean, why stop there? 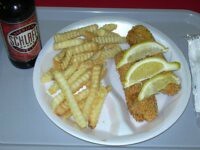 I wish there was a fish fry that did home made chips to go with. That’s what I remember so fondly from the fish frys of my youth. Fried buffalo fish and home made potato chips, but alas, that’s a whole other can of worms, that I’m not opening up here. This is either an outrage or we’re just missing where the beer was located. So here we have the meal itself. As you can see on the left, the tiny lemonade and on the right, my bud select. 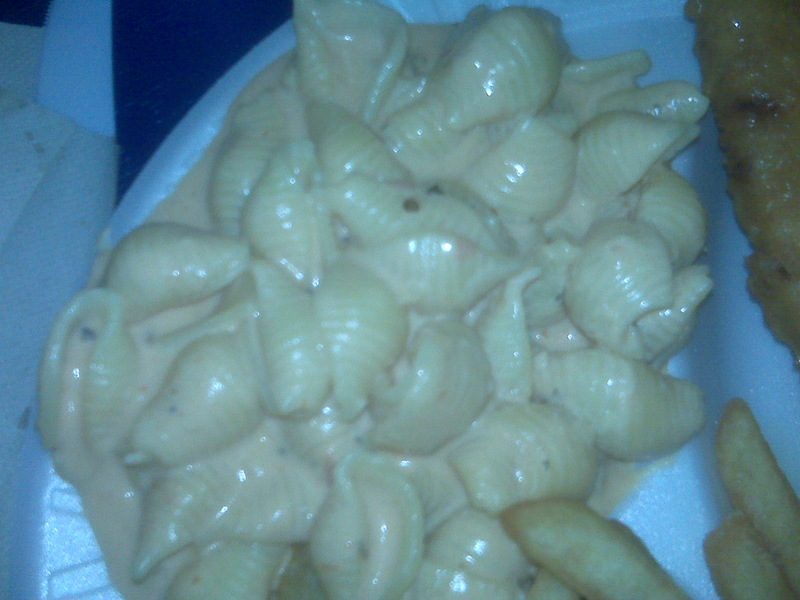 In the middle my fries, fish, and red sauce pasta. The fries were not the normal fries you get. These were very, very tasty and something special. They were seasoned and I really wished I had ordered two orders of it instead of my red sauce pasta. I keep calling it that because there were two different sides of eggshell pasta. One with white sauce, and one with red sauce. Unfortunately, this week, I didn’t have my good camera, but only my BlackBerry, so I apologize for the quality of the photos. So you really cannot see the red color, pale though it was, of the pasta, but as your friend and humble narrator, I assure you, it was red. See? Even here you cannot see that this was red pasta. Oh well. As I drank my beer and my dinner. I really, REALLY loved the fries. The red pasta was just ok. It’s nothing I would do again. If I ever get back here, I’m going to skip the pasta and just double up on fries. As always, I skip the bread they try to give me. cooked slightly less time. I feel like I should be able to cut the fish without using a knife, and I did have to use my knife to make this work, but with the lemon I added, it was very tasty. Slow: Joan of Arc, St. Gabriels. Epiphany and Immaculate Heart are definitely the fastest fish frys I’ve attended thus far. I was also treated to nice desert after my meal. When we paid for dinner, it said that there would be a dessert provided while supplies last, and since we arrived around 6:30pm, I expected nothing to be left, but there was in fact a full table left. 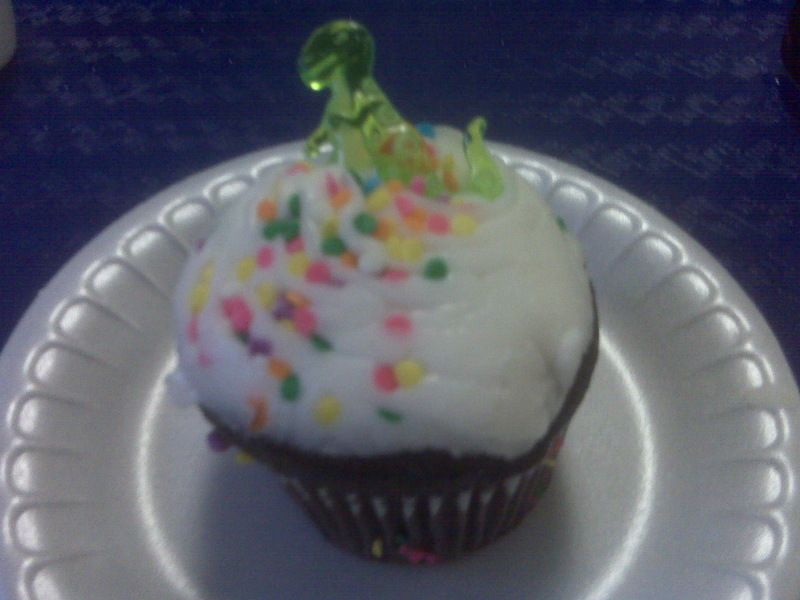 Too bad there was not too much of the sweetie variety that I particularly enjoy, so I chose a cupcake with a green dinosaur on top. Look I don’t understand this dinosaur any more than you do. All in all, the worst thing I can say about Immaculate Word is that they’re just not as good as St. Stephens, and that is pretty good if you ask me. I would request an upgrade on the beer selection, but I may be asking for too much. Most places have the same beer: Bud, Bud Light, and Bud Select. 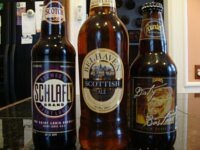 It’s quite the treat when we can enjoy a Schlafly with our fish. Definitely worthy of making a special trip.